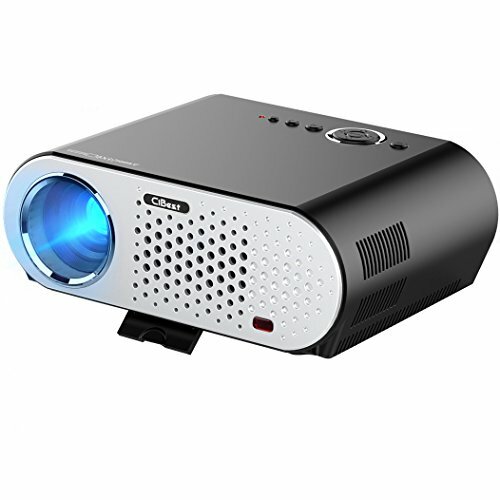 CiBest Video Projector,with High Brightness and big screen can meet all your expectation with this 3500 LMs full 1080p HD home theater entertainment projector,you can can educate your child,watch movie,play games with such a large screen! What can you enjoy from this video projector? ♥Built-in Stereo Speakers(4Ω,5W), perfect for home viewing and play games,and 3.5mm audio can connect with external speaker for better listening experiences. ♥Keystone Function,Adjust the image manually with keystone, avoid image distortion. ④ MULTIPLE INPUTS: 【Dual HDMI, VGA, Dual USB, AV】 【Support: Multi-media (Music, Picture, Video, TXT); 】Connect your Computer / Laptop / Mobile / iPhone / iPad / Blu-ray DVD Player to enjoy video or movie; Connect PlayStation PS3 PS4 or X-Box X-360 X-One via HDMI port to enjoy games on so big screen. It also can be ceiling on the mount. Enjoying watching movie and sports match at home, also applying to courtyard or outside.